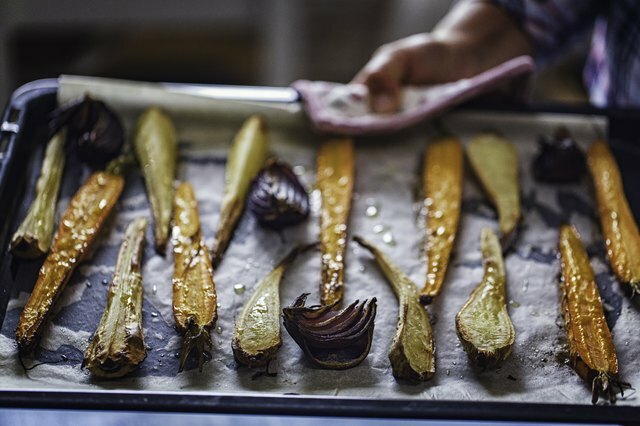 Roasting vegetables on the stovetop is a fast, easy way to produce tender cooked veggies with slightly crisp, caramelized edges. 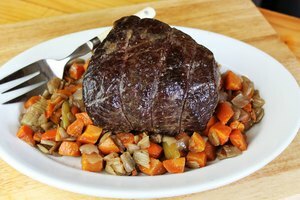 You can pan roast any vegetable, but tailor your cooking technique to different kinds of veggies. Serve pan-roasted vegetables alongside baked or mashed potatoes and braised meat for a fast, healthy supper. Clean and peel the vegetables as needed, patting them dry to remove as much excess water as possible. Too much residual water will cause the veggies to steam rather than roast as they cook. If you are cooking different vegetables in the same pan, cut them so that they will all be ready at the same time. 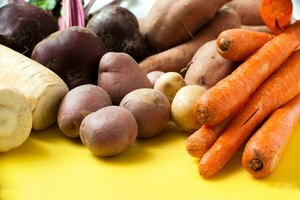 Starchy vegetables, such as potatoes, should be cut into 1 1/2- to 2-inch pieces to ensure moderate cooking times. Smaller vegetables – such as medium-size carrots or mushrooms – can be kept whole or cut in half. Fast-cooking vegetables, like broccoli, can be just split in half and cooked as is. All the vegetables, cut or not, require an even coating of oil before cooking. Choose an oil with a high smoke point, because of the high heat needed for pan roasting. 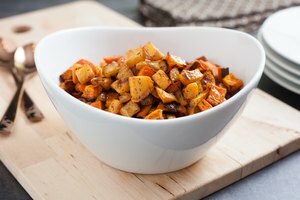 Some vegetables, like mushrooms and cut eggplant, are more porous, and will absorb the flavors of fresh or dried spices if they are left to sit. 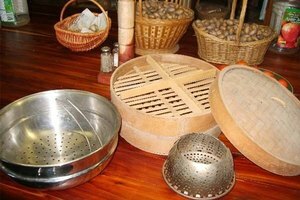 However, in general, dried or fresh herbs, like rosemary or thyme, can be added to the pan as the vegetables are roasting. The high heat will release the aromatic compounds and oils in the herbs, seasoning the vegetables as they cook. Dried, ground spices, such as garlic powder, can be added after the oil and before cooking. In general, use 1 1/2 times the amount of fresh spices than you would for dried spices, to achieve the same pungency. Warm a heavy-bottomed pan on medium-high to high heat. Do not use a nonstick pan as this will prevent the vegetables from browning. Choose a wide-bottomed pan to cook more vegetables at once. Ideally, it should have low edges, as high sides will capture the steam from the vegetables as they cook, leading to a mushy texture. Add a thin layer of oil to the pan, coating the entire bottom. When the oil is smoking, add the vegetables. Cook in batches if you are roasting many vegetables. Overcrowding can lead to poor caramelization and mushy vegetables, so leave a little bit of space between all the vegetables for optimal results. 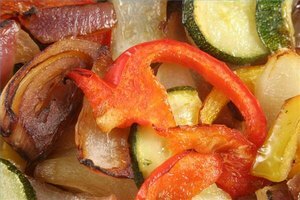 Stir the vegetables once or twice during roasting, but leave them mostly undisturbed to help them blacken. The vegetables are done when they are soft and cooked throughout. Let the vegetables sit, covered, at the back of the stove or in an oven to keep warm until ready to serve. To serve, dress the vegetables with a sprinkle of salt, pepper and freshly minced herbs before tossing with the pan juices and oil and plating. You can also squeeze some fresh lemon juice onto the veggies before serving and drizzle with an infused oil for a fancier presentation.